Super strong! 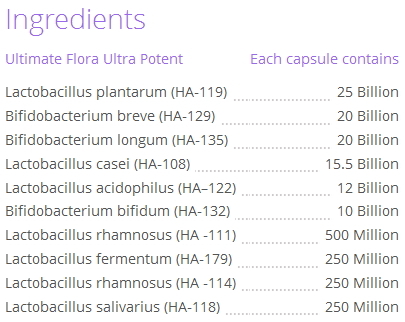 Every protected capsule of Ultimate Flora Ultra Potent contains 100 billion beneficial bacteria from 10 strains. This formula is ideal for those with chronic digestive issues and individuals who are using or have used antibiotics. Ultimate Flora Ultra Potent is a 100 billion culture, 10 strain probiotic formula designed for those with severe digestive issues, those who have completed multiple rounds of antibiotics or for those who want to have the strongest probiotic available. Directions for Use: Adults, adolescents and children 6 years and older take 1 capsule per day, approximately 2 hours after food. Take at least 2 – 3 hours before or after antibiotics.